Sometimes, a simple addition can dramatically enhance your outdoor space. Take, for example, an outdoor bar. Though their functionality and build is rather straightforward, outdoor bars have emerged as valued outdoor enhancements that create an ideal entertainment space for homeowners and guests alike. Thanks to outdoor bars, all of your beverages can be easily accessible for every get-together and barbeque—no more wandering back into the house for everyone’s favorite drinks! With a new outdoor bar, friends and family will be impressed and inspired by your new luxurious and convenient backyard addition. But in order to create an outdoor bar that truly resonates, you need one that’s strategically designed and incorporated into your backyard. That’s where Topaz Design Group steps in to help. 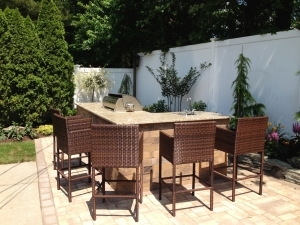 With an outdoor bar designed by our team, your unique, innovative feature will function as an ideal focal point in your backyard space. When it comes to style, your choices for an outdoor bar are endless. At Topaz, we provide the expertise you need to create a bar that will make your guests never want to leave. Using our years of experience in installing outdoor bars, we first evaluate your outdoor living space. From there, we determine where your bar will garner the most attention, and then seamlessly blend it with your other dining and seating areas. Whether you want a wet bar for refrigeration and lighting, or a dry bar to store your coolers, our completed work is guaranteed to keep guests enthused all night long. An outdoor bar works wonders in making your yard more elegant and entertaining. To begin your own project, complete our online form today, and our team will be in touch shortly.